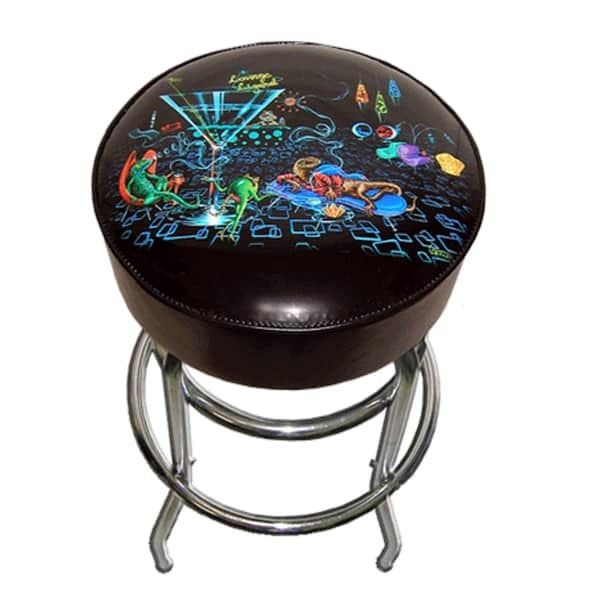 Loosen up like a Las Vegas lounge lizard at your bar with this Bar Stool designed by the ever-popular Michael Godard. Known as "The Rock Star of the Art World", Godard showcases casino-themed paintings that will look at home under any billiard room's bar. This comfy bar stool ex emplifies Godard's style, featuring hip lizards lounging on contemporary sofas, drinking martinis and smoking cigars. With a giant martini glass and lava lamps in the background of this scene, one of Godard's signature olive characters serves the drinks.